APE Boards can be installed quickly and easily. The new APE OLED board features a high contrast, high resolution Organic LED (“OLED”) creating an extremely intuitive, user friendly, and powerful human-marker interface (HMI). APE LED Boards offer a similar LED interface with bright, easily distinguished colored LEDs to make programming easy. The APE OLED display boasts a dynamic contrast ratio of 2000:1, and pixel resolution over 2.5 times that of other OLED boards. This results in a more clear, sharper display with more than double the displayable information on any given screen. APE LED Boards offer the brightest and most easily identified colored LEDs in the industry. 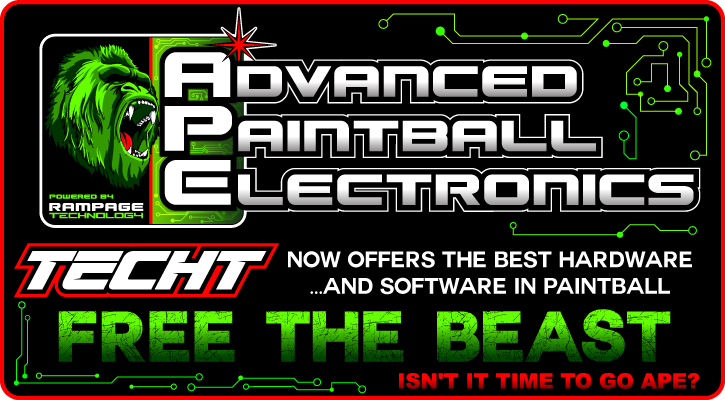 The new APE OLED board series sets a new technology precedent for aftermarket paintball boards. At the heart of operations is a 2 MIPS (million instructions per second) micro-controller coupled with fully interrupt driven I/O that’s guaranteed to never miss an event. All of the internal firmware is architected with 100% highly optimized native RISC instructions (no compiled code) that seamlessly weaves display I/O and marker operations together in real time. 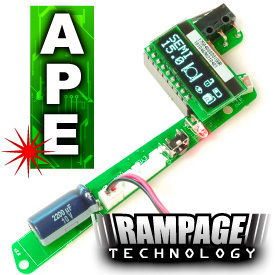 The APE OLED board features a new semi-automated “Tune Assist” feature that allows users to quickly tune their marker for peak efficiency and speed by providing quick adjustment of both solenoid dwell and bolt return timing. Once the tuning procedure is complete, these adjustments are automatically stored in ALL user profiles eliminating the need to individually program them. This feature will allow you to install your new TECHT Hardware easier than ever before. • Rule change “immune” Tournament Modes that are fully user configurable. • Live rate of fire “Trigger Trainer” with instantaneous pull rate, peak and average pull rate all in real-time. * Default Tournament Modes. Other tournament formats are user definable. ALL APE BOARD TECHNICAL ISSUES, SUPPORT, RETURNS, AND REPLACEMENTS MUST EMAIL APE AT support@goapeonline.com to get technical support or an RMA for return. We no longer accept warranty returns on APE Boards, regardless if you bought it from us or not, per APE's request. Items/Page: 15 30 45 60 Sort: Default Item Name Item Number Manufacturer Filter By Mfg: A.P.E. This is the board you need if you are using an A5 WITHOUT the H.E. Selector Switch on the side of the trigger frame. This is the board you need if you are using ANY DM (DYE MATRIX) with Ultra-lite Trigger Frame. This board comes with new grips that allow you to view the board. This is the board you need for your Invert Mini or AXE. Combo includes The APE Board for the X7 & A5 H.E. W/ PowerShot Solenoid and our TechT Phenom Trigger modified for use with the APE Board.